one happy little crafter: Sweet Fairy Wishes! Hello there my dear blog friends, hope the week, and indeed the month, has started well for you. So far my plan to blog more this year, has got off to a good start, so the next plan is to try and revisit stamps and digi's that haven't seen the light of day for a wee while - and today's card does exactly that. I found this super cute little fairy stamp in a £1 bargin bin at a craft show last spring but I am almost ashamed to say, that this is her first outing! in the pink - bling it on! 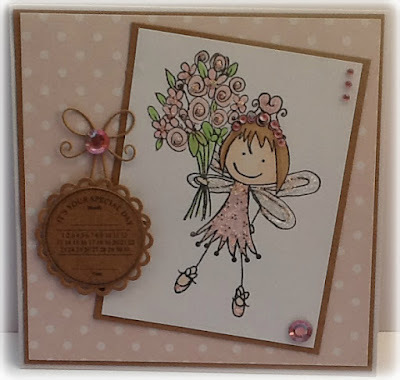 A great card for our sparkle theme Lisa, many thanks for joining us at Allsorts challenge. What a beautiful card, lovely image and what a great idea for the circle die, love it all. Very cute card. Love how you did the sentiment. Thanks for joining the In The Pink challenge this time. Hope to see you again.